Germs for sale! Buy 1 get 1 free! I LOVE to shop, in fact many refer to me as a shopaholic. The best feeling is scoring a sweet sale, especially a BOGO (buy one, get one free) deal, because more is better right? However, the one thing that sobers my shopping high is the wise saying from my mother “it’s not a deal if you don’t need it”. You might be wondering what the link between shopping and disinfection is. Well, conducting disinfectant efficacy testing is much like taking a shopping trip to your favourite department store. There are endless pathogens to choose from, some designer which are very costly and others that are staples and necessary to have on your product label. I am sure we have all treated ourselves to a shopping spree where we have bought things we don’t need. And guess what…disinfectant manufacturers do to! In an effort to look more effective many disinfectant manufactures will list an infinite number of pathogens on their product label. The catch? These claims are either irrelevant or are different strains of the same pathogen. It’s like buying 100 different camisoles when you only really need a few (black, white, etc). When cleaning and disinfecting surfaces, it is important to consider what pathogens are relevant to patients, clients, and the facility and focus your attention on a disinfectant formulation that provides a balance between effectiveness and minimal toxicity to increase user compliance. So what if you’re “shopping” for a particular pathogen but it’s not listed on your disinfectant’s label? Does that mean the disinfectant won’t be effective? Not necessarily. The easiest thing to do is identify what kind of pathogen we are dealing with and where it sits on the hierarchy of susceptibility. Is the pathogen a virus, bacteria, fungi, mycobacteria, or bacterial spore? 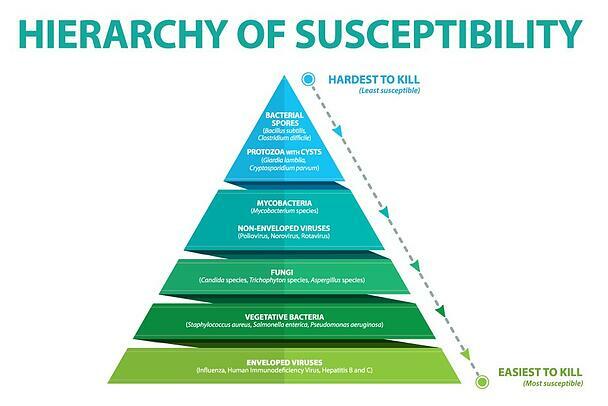 Once you’ve identified what kind of pathogen we are dealing with, using the Hierarchy of Susceptibility, the next step is to identify where the pathogen sits on the pyramid. Using the Gold Standard pathogens, one can see what pathogens should be included on the product label to determine if efficacy can be expected. For example, if your facility is concerned with Influenza (since we are getting into Cold and Flu season) and it’s not listed on your product label, if you do a quick Google search you will see that Influenza is an enveloped virus which sits at the bottom of the pyramid. This tells you that Influenza is easy to kill via chemical disinfection. Next, looking at your disinfectant product label, if your disinfectant has efficacy claims against the gold standard pathogens for viruses (Poliovirus or Adenovirus) efficacy against Influenza can be expected, especially since the gold standard pathogens for viruses are non-enveloped which are much more difficult to kill. So if your disinfectant can kill the more difficult to kill germs efficacy can be expected against the easier to kill germs. So where does AHP® fit into all of this? As much as I love to shop, we don’t believe in adding claims to your product label for the sake of adding claims. Instead we aim to include the most relevant claims across the susceptibility pyramid. All AHP® based disinfectants contain efficacy against a broad spectrum of pathogens including enveloped viruses, vegetative bacteria, fungi, non-enveloped viruses, mycobacteria (RTU and Wipes), and there are even AHP® formulations with claims against bacterial spores. AHP® provides fast and consistent, broad-spectrum efficacy protecting your facility against pathogens you are most concerned with, without compromising safety to the user or environment. Download our efficacy flow chart to ensure you disinfectant is effective against the pathogens your facility is currently battling. The Legacy Chemical Coalition has upped its game since the Microbe Militia grew in size. Previously requiring cleaning prior to disinfection, many members of the Legacy Chemical Coalition have re-formulated themselves to become One-Step cleaner disinfectants, eliminating the need to pre-clean making them more efficient during battles. Unfortunately, there is a common misconception that products labelled as One-Step cleaner disinfectants are also good cleaners. When a disinfectant is labelled as “One-Step” all this means is that the product has proven to remain effective in a 5% soil challenge, it does not mean that the product is a good cleaner. The truth of the matter is, some One-Step products actually have poor cleaning capabilities. What makes a disinfectant a good cleaner is its surfactant package. Surfactants act as detergents which use an electrical charge to lift and remove soils from the surface. There are 3 main types of surfactants used in disinfectants: anionic, non-ionic, and cationic. Anionic surfactants have superior cleaning abilities as the electrical charge from the anionic surfactants interacts better with soil particles allowing for easier removal. Non-ionic surfactants help in preventing redeposition of soils that have been lifted off the surface. In other words, non-ionic surfactants grab onto the soils and hang on to them. The last category is cationic surfactants which are used in Quaternary Ammonium Compound (Quat) based disinfectants. Cationic surfactants have antimicrobial characteristics which is why they are often found in Quat based hard-surface disinfectants, but do not interact with soil particles as efficiently as anionic surfactants. The Accelerated Hydrogen Peroxide® (AHP®) technology utilizes both anionic and non-ionic surfactants to efficiently remove soils from surfaces. In fact, AHP® has been proven to prevent cross contamination! Don’t believe me? Download this Disinfectant Digest to learn more! A nd if you want to see AHP® in action watch the following video showing the difference in cleaning capabilities between AHP® and a leading Quat-Alcohol product. With the cleaning confusion cleared up, it’s time to take on the Microbe Militia. Keeping a clean and disinfected surface ensures surfaces remain free from harmful microbes and that patients, clients, and staff are better protected. How would you rate your stethoscope hygiene? Would you eat your dinner without washing your hands after using the restroom? My guess is probably NOT. We accept the important role hand hygiene plays not only in our personal lives but in the lives of our patients. In fact, next time you visit a family member or friend in the hospital count how many hand hygiene stations are present. Hand hygiene has been the focus of infection prevention education for quite some time now. With campaigns like “Clean Hands Save Lives” we are seeing more and more compliance with hand hygiene programs. BUT, have you ever considered stethoscope hygiene compliance within your facility? Microbiological data have shown that stethoscope contamination after a single exam is comparable to that of a physician’s dominant hand. To put that into perspective, total bacterial counts on the hands of medical personnel have ranged from 3.9 x 104 to 4.6 x 106. That’s up to 4,600,000 pathogens that could contaminate a single stethoscope! Common pathogens cultured from stethoscopes include Staphylococcus aureus, Pseudomonas aeruginosa, Clostridium difficile, and VRE. Did you know that for S. aureus an infectious dose is only 100,000 organisms? Even scarier, the microbe infectious dose is unknown for P. aeruginosa, C. difficile, and VRE highlighting the importance of preventative measures. 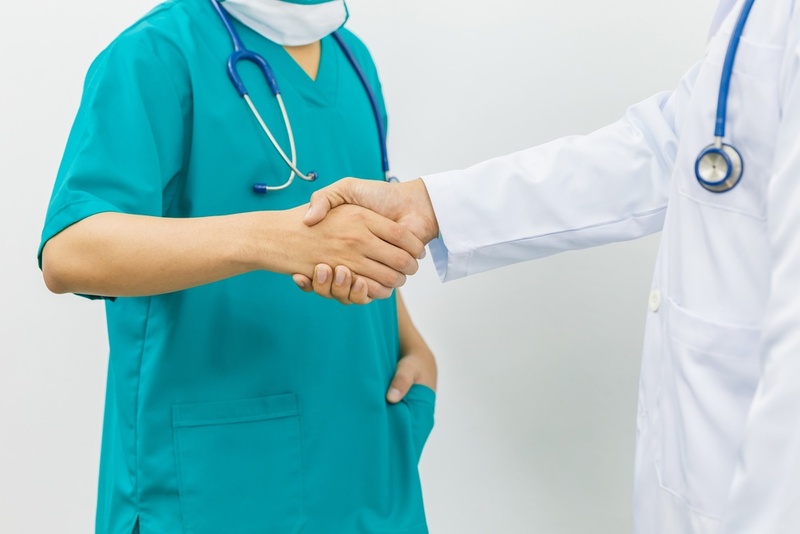 A new study in the American Journal of Infection Control looked at the impact that education, reminder flyers, and the provision of cleaning supplies had on stethoscope hygiene. At the end of the program, the results indicated that there was NO change in stethoscope disinfection compliance and hygiene remained at ZERO. Are these results surprising? Not really when you consider all the research that has looked at cleaning and disinfection protocol compliance. Take the study by Havill and Boyce for example on “Cleanliness of portable medical equipment disinfected by nursing staff”. In this study ATP (adenosine triphosphate bioluminescence) and aerobic cultures were used to assess the cleanliness of portable medical equipment disinfected by nurses between each patients use. It was discovered that the equipment was not being disinfected as per protocol and that education and feedback are an essential element to improving disinfection. There is a plethora of research that supports this same conclusion that education, monitoring, and feedback play an imperative role in improving disinfection compliance. Two more powerful examples come from Drs. Alfa and Boyce. In a study by Alfa et al, housekeeping staff were provided an effective Accelerated Hydrogen Peroxide® (AHP®) based disinfectant which was combined with proper training, education, compliance monitoring and feedback. The study resulted in a 20% reduction of HAIs including MRSA, VRE, and C. difficile. In a similar study by Boyce et al, the use of AHP®, education, and compliance monitoring resulted in a 23% reduction of HAIs! While this research has been primarily targeted towards the decontamination of environmental surfaces, it can certainly be extrapolated to patient care equipment such as stethoscopes. 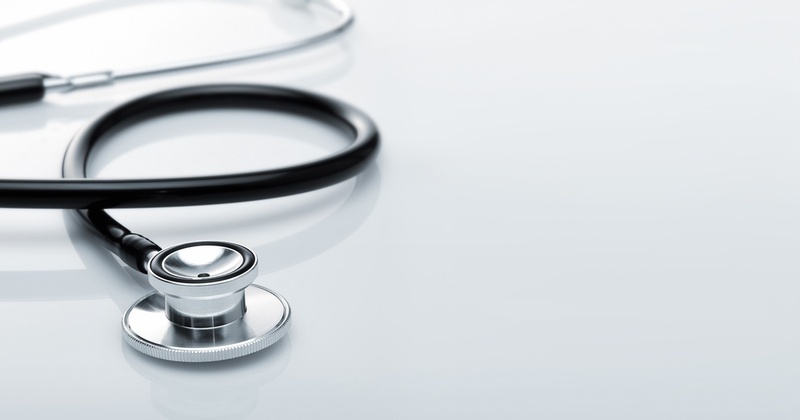 It is evident that this study highlights not only the risk stethoscope hygiene incompliance has in healthcare facilities, but it reveals an overlooked infection control issue and how rarely stethoscope hygiene is done. 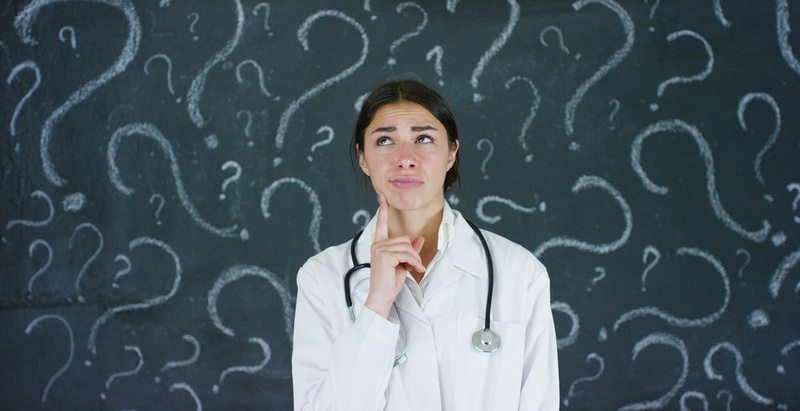 Providing standard education may not have been the answer in increasing disinfection compliance in this particular study, but perhaps a more holistic approach is required that includes education, compliance monitoring and providing feedback to staff. Because how can anyone improve if they aren’t being properly trained or given guidance on ways to improve? Get started on your education, training, compliance monitoring and feedback program today using our Stethoscope Disinfection Protocol! And for more resources on the effects of compliance monitoring download these Disinfectant Digests! Picture this. A two year old boy faints from not eating in two days. A 12 year old girl is sold by her family to be a child bride just so they can feed the rest of the family for a week. A young child can’t attend school because he can’t afford shoes. 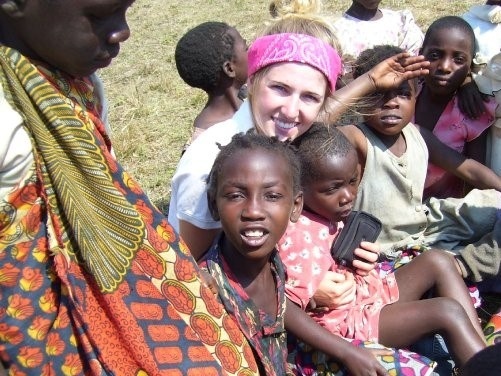 This is what I witnessed first hand in Zambia, Africa 8 years ago. I spent 2 months travelling to a number of different rescue units for orphans affected by AIDS. As you can imagine, my perspective of life back in Canada dramatically changed. The things I so often took for granted or complained about seemed so miniscule compared to the hardships people living in third world countries have to face on a daily basis. It really hit me when I got into a minor motorcycle accident while in Zambia. Being 6 hours away from the nearest medical clinic, I was lucky that I only got a couple bumps and bruises and was not seriously injured in the crash. It was in this moment, that I realized how lucky I truly was to have available healthcare back home. Working in the infection prevention industry for 3 years now, I have also come to realize how lucky we are to have advanced infection prevention knowledge compared to other countries around the world. With endless resources, education, and research we are constantly working towards change to better the health of our patients. There are however, many countries around the world where there is very little opportunity to learn about infection prevention. This lack of opportunity results in knowledge gaps, illness and death that are completely preventable. Take Ebola for example. Thousands of lives in West Africa were claimed as a result of ineffective infection control measures. A lack of proper PPE, isolation precautions, clean water for hand hygiene, and cleaning and disinfection of environmental surfaces greatly contributed to the spread of Ebola. This spread resulted in a staggering number of healthcare worker Ebola associated deaths. In fact, 10% all Ebola deaths were Healthcare workers. So how did this devastating outbreak finally get contained? Simple. Education. In 2014 there was a massive effort to educate and train healthcare workers to properly handle patients infected with Ebola. But why did thousands of preventable deaths have to happen before effective training and education became available? The obvious answer is that the resources were simply unattainable. Fortunately, the path is being paved to make infection prevention education more readily accessible. The Infection Control Africa Network, Stellenbosch University (Cape Town), and Webber Training created Teleclass Education Africa to provide basic infection control education to African healthcare workers. It is the ONLY initiative to provide such education. Teleclass Education brings lectures on infection prevention and control topics by the world’s top authorities on the subjects to a global healthcare, academic, and regulatory audience. The end goal is to ultimately prevent another crisis such as Ebola before it begins. As a non-for-profit organization, Webber Training is raising funds to support this critical initiative. 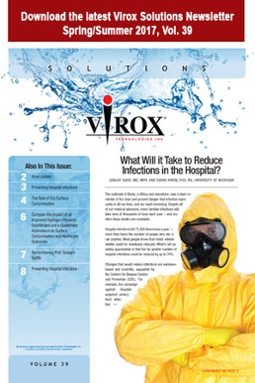 At Virox Technologies, we are passionate about providing accessible education to the infection control community. More than 5 years ago Virox introduced a bursary at the bi-annual Infection Control Africa Network Congress conference to sponsor African scientists to present abstracts on infection control projects specifically on the topics of disinfectants and disinfection or sterilization systems. We see the value in the education and information provided by Webber Training and are a proud sponsor of this essential resource. To continue the momentum in Africa we have made a special contribution to Teleclass Education Africa. If you wish to learn more about this important resource for the African healthcare community, or if you wish to make a contribution you can visit their Go Fund Me page. Together we can all make a difference. Does your disinfectant suffer from Safety Indifference Syndrome? We know that chemical disinfectants are widely used in infection prevention, as such, our reliance on them is imperative. When choosing a disinfectant, it seems the focus revolves around what the disinfectant kills and costs, forgetting about other criteria such as the level of safety a disinfectant offers. Research has indicated that disinfectant products have the potential to contribute to respiratory hazards including the onset of asthma or exacerbation of existing asthma. Additionally, disinfectants have been associated with acute illness reports among workers, primarily affecting the eyes and skin. A 2010 report by the CDC highlighted that the most common active ingredients responsible for illnesses were Quaternary ammonium compounds (38%), glutaraldehyde (25%), and sodium hypochlorite (18%). The majority of the types of injuries associated with the use of disinfectants were: 222 eye injuries, 130 neurologic injuries (headaches), and 121 respiratory injuries. These occupational human health hazards not only have negative physical implications, but also negative economic impacts both directly and indirectly. And did you know that it has been shown that disinfectants which are perceived as toxic by staff are less likely to be used correctly, reducing user compliance and increasing the risk of pathogen transmission? Employers have a legal responsibility to provide a safe working environment for staff and patients which includes choosing disinfectants that are not going to cause harm to staff or patients. Choosing an effective disinfectant with the best safety profile will not only prevent the transmission of harmful pathogens but will aid in the prevention of workplace incidents. Unfortunately, most disinfectants have to compromise between safety and efficacy with the focus being more on what the product can kill. This compromise is often made as it is a common belief that due to their toxicity to microorganisms, disinfectants are also toxic to human health resulting in user apprehension and decreased compliance. So how do you identify the safety profile of a disinfectant? The best way to know is by reading the products Safety Data Sheet (SDS), which is a summary document that provides information about the hazards of a product and advice about safety precautions. On the SDS, sections 2 and 11 should be reviewed to identify product hazards and toxicological data. Pay special attention to section 2 which is an overview of the disinfectants hazards identification. This section will tell you the GHS classification, signal words, hazard pictograms and precautionary statements. Ideally, you want your disinfectant to not be classified by GHS and have no hazard pictograms or hazard statements. Furthermore, section 11 will provide you the toxicity results of the disinfectant. All disinfectant manufacturers must have their products tested for oral, dermal, and inhalation toxicity by a third party laboratory. These results ultimately determine the content that’s required in section 2. Is it possible to have a disinfectant that is both effective and safe? Do you need to compromise one for the other? The answer is NO! Accelerated Hydrogen Peroxide® (AHP®) based disinfectants are based on chemical synergies. What this means is that instead of adding more chemicals to make our disinfectants more effective against germs, we play with the formula until we get a new synergy. This results in enhanced formulas that offer a faster, and better efficacy without compromising user safety. AHP® is designed to be non-toxic, non-irritating, and non-sensitizing. At the in-use dilution, AHP® is not classified under GHS, has no associated hazard pictograms, and no hazard statements. Furthermore, AHP® does not utilize any ingredients that are carcinogenic, mutagenic, or have reproductive toxicity, giving user’s confidence that they won’t be harmed by their disinfectant if used according to the label directions. So why compromise when you don’t have to? Accelerated Hydrogen Peroxide® (AHP®) based disinfectants have accomplished the balance between safety and efficacy like no other. I hope this will lead you to evaluate your current disinfectant choice within your facility and review with your team the pros and cons. 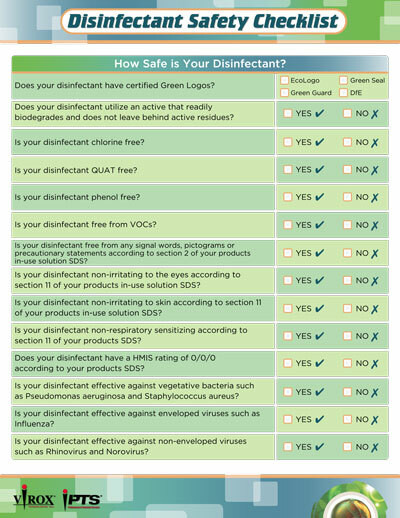 Download our Safety Checklist to evaluate your disinfectant today! 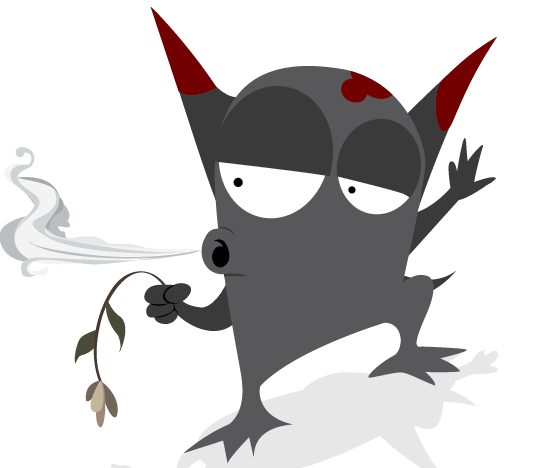 Don’t you hate the noxious fumes of gluts? Perhaps you just purchased an inexpensive high level disinfectant, only to realize that now you need to install a fume hood to comply with OSHA regulations. Or maybe waiting a whole 20 minutes for your instruments to be disinfected drives you crazy because now you need to purchase multiple instrument sets to account for your high turnover. For some, the very term “high level disinfectant” might be alarming as you likely associate high level disinfectants as being toxic and an impediment on your productivity. But we have some exciting news to share! The same Accelerated Hydrogen Peroxide® (AHP®) technology that you know and love in your surface disinfectants is now available in a High Level Disinfectant (HLD) for your semi-critical instruments and devices! Prevention™ HLD8 is a smart and innovative solution that is different from other chemistries such as the commonly used Glut (glutaraldehyde) or OPA (ortho-Phthalaldehyde). Prevention™ HLD8 is FDA registered and provides high level disinfection in only 8 minutes meaning you can reprocess your instruments faster. Once poured, Prevention™ HLD8 can be re-used for up to 21 days so your solution can go further improving staff productivity and saving you money. With Prevention™ HLD8 you no longer have to worry about dermatitis or respiratory distress as Prevention™ HLD8 is formulated using ingredients that are non-toxic and biodegradable. In fact, you can forget about fume hoods, special ventilation and respiratory PPE. 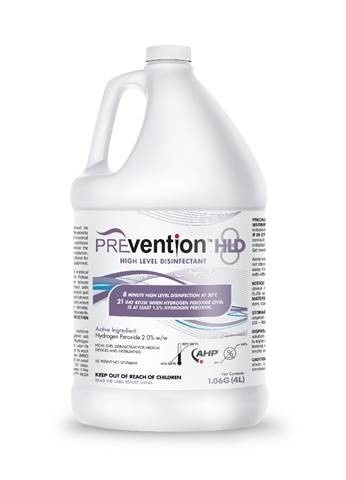 Best of all, unlike other high level disinfectants, Prevention™ HLD8 can be poured safely down the drain. Why compromise the safety of patients and staff if you don’t have to? We are thrilled to offer our new Prevention™ HLD8 High Level Disinfectant to the US market as part of the AHP® portfolio which now supports the disinfection of both surfaces and devices in the Alternative Care and Animal Health markets. With Prevention™ HLD8 you can get a complete AHP® portfolio solution for all your disinfection needs. And for our Canadian friends, don’t worry! You can still access our high level disinfectant and chemical sterilant with Preempt HLD5 and Preempt CS20. We are excited to deliver the most recent Virox e-newsletter, featuring a compilation of articles from global thought leaders on the most recent advancements in infection prevention & control. Compare the Impact of an Improved Hydrogen Peroxide Disinfectant and a Quaternary Ammonium on Surface Surface Contamination and Healthcare Outcomes, Nicole Kenny, Professional and Technical Services, Virox Technologies, Inc.
Click the image to get your you e-news now! Who Will Save Us From The Microbe Militia? After preying on hands, surfaces, and devices that have fallen victim to common disinfection myths and mistakes, the Legacy Chemistry Coalition is requesting back up. It is evident that the world is in need of a new super hero, one with all the characteristics of an ideal disinfectant and with the capabilities to fight on all three battlegrounds…hands, surfaces, and devices. So what does this new superhero look like? Our new super hero will need to have a broad spectrum of germicidal efficacy in fast and realistic contact times in order to defeat the Microbe Militia. Our super hero must not be affected by environmental factors that the Microbe Militia tries to hide behind such as organic matter or temperature. Our super hero must be safe for those she is trying to protect by being non-toxic to users and kind on surfaces. Our super hero must not be detectable by the Microbe Militia by being odorless, soluble, and stable. Our super hero must get the job done efficiently with exceptional cleaning capabilities and without causing harm to the environment. And finally, our super hero must be economical and easy to use so her powers can be leveraged in healthcare facilities around the world. If you are wondering who this new super hero is we hope that you will visit us at the national APIC conference in Portland, OR, or the IPAC-Canada conference in Charlottetown, PEI as we unveil our new super hero to the public. 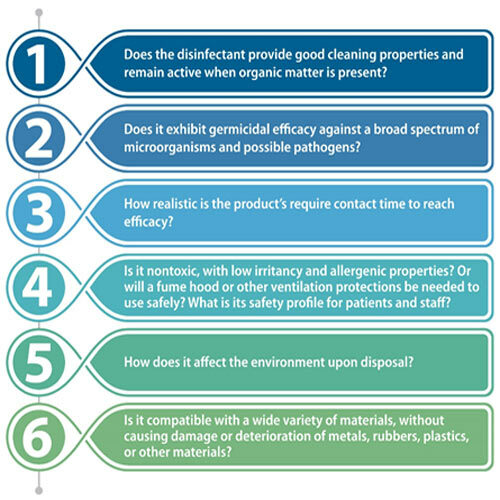 In the meantime, ask yourselves these key questions about the disinfectant you use in your facility. Are you using a super hero disinfectant technology or is your disinfectant part of the Legacy Chemistry Coalition? See you at APIC and IPAC! It’s been one week since the Infection Prevention Army exposed the disinfection myths spread by the Microbe Milita. Have you been able to dispel any the myths in your facility? Or perhaps you have uncovered some myths of your own. 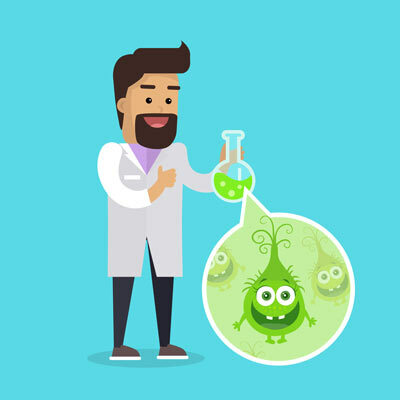 While the Infection Prevention army was able to expose these falsehoods, the Microbe Militia is now more aggressive than ever preying on hands, surfaces, and devices that are vulnerable to common cleaning and disinfection mistakes. We typically believe that when it comes to hand sanitizers and soap, one size fits all, which is evident by new automated hand hygiene stations. However, we need to consider the size of our hands when it comes to using hand sanitizers and hand soap to ensure that adequate coverage, and therefore efficacy of the product can be met. The volume of hand soap or hand sanitizer should be large enough to cover the whole surface area of both hands. Not washing hands for long enough or frequently enough to reduce the potential for bacterial transfer, we need to wash our hands for longer than 15 seconds (try singing Happy Birthday in your head) and should practice hand hygiene before initial contact with a patient or items in their environment, before putting on PPE when performing an invasive procedure, before preparing, handling, or serving food or medications to a patient, after care involving contact with blood or body fluids, immediately after removing PPE and before moving to another activity, after contact with a patient or items in their immediate surroundings upon leaving the room, and finally, whenever in doubt. Not using moisturizer after practicing hand hygiene. Good skin condition is an important element in ensuring good hand hygiene practice. Frequently washing hands can lead to drying of the skin where pathogens can harbour. Reconditioning creams help maintain healthy skin and avoid dryness. In other words, the surface being disinfected does not stay wet with the right concentration of in-use solution disinfectant for the full length of time required for efficacy. If you wet a surface down via spray bottle and immediately wipe the surface dry, it won’t be effective. In addition, spray bottles increase the risk of a pathogen getting blasted onto another surface. It’s better to spray the disinfectant onto the cloth to wet it down, then use physical friction to apply the product to the surface. This helps pick up any soil, debris and microbes you cannot see and finally, provides a more even distribution of the disinfectant solution onto the surface than random splatters from the spray bottle. When the disinfectant air dries you have a better chance of achieving the designated contact time. Making this mistake means you’ve just mixed old disinfectant with new. This can lead to an over-diluted or inactivated mixture. In other words, it won’t work as well and there’s science to prove it! Eyeballing the required dilution of disinfectants is often a result of not having access to a dilution system or not having dilution systems in a convenient location. When disinfectants are not accurately diluted you can either get solutions that are not strong enough which will not provide the desired germicidal efficacy, or you get solutions that are too strong which can put the safety of staff at risk. Furthermore, if you do use a dilution system, it’s essential to ensure that dilution systems are maintained to ensure they can properly dilute disinfectant solutions. Did you know that some disinfectants or the cleaning substrates used to clean can transfer pathogens from surface to surface during the cleaning and disinfection process? 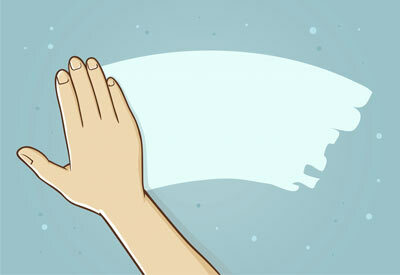 When disinfecting it’s important to ensure that we use a clean cloth (no double dipping! ), or fresh pre-saturated wipe for each surface being disinfected to prevent picking up pathogens from one surface and depositing them onto another surface. In addition to knowing the shelf-life of the disinfectant, it’s important to know how long the shelf life of the re-use period is to ensure there is enough active in the solution to continue to work properly. The in-use shelf-life for some disinfectants may only be single use, or as long as 30 days. The concentration of active ingredient within the re-use solution should be validated using chemical indicator strips. It’s also important to read the product label as it pertains to the shelf life of the solution once the bottle has been opened. The shelf life of some disinfectants is dramatically reduced once the bottle has been opened. Just because you learned how to clean from a family member at home doesn’t mean you know how to properly clean and disinfect in a device reprocessing setting. And, just because you know how to use one disinfectant does not mean you know how to use another one. Different disinfectants work different ways with various shelf lives, contact times, and safety precautions. Disinfectant manufacturers or sales reps can provide training materials or lead staff training sessions. Just ask. 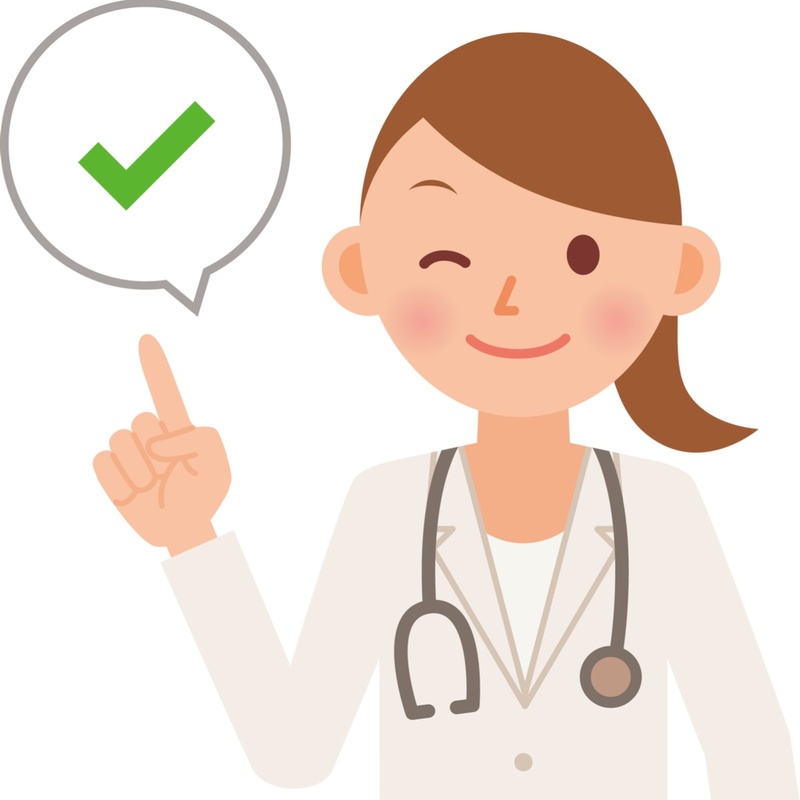 It may also be beneficial for both staff and patients to implement a compliance monitoring system to ensure that important processes and policies are being followed and disinfectants are being properly used. As an essential member of the Infection Prevention army, my hope is that you will be extra diligent in ensuring that these common blunders are avoided in your facility so that together we can defeat the Microbe Militia. This is a tale of the Microbe Milita. Who doesn’t love a good fairy tale? I am sure you know the ones where the prince and princess fall in love, live happily ever after and there is ALWAYS a happy ending. But have you heard the tale of the Microbe Militia? Unfortunately, this story doesn’t always have a happy ending. The Microbe Militia invades hands, surfaces, and devices, spreading falsehoods about disinfectants which leads to adverse outcomes such as disease and even death. Thankfully the Infection Prevention army can expose these disinfection myths to reduce the Microbe Militia’s stronghold and get that happy ending patients and clients deserve. Not true. Cleaning uses detergents and surfactants to break up soils (visible or not) on surfaces. Disinfectants kill or inactivate microorganisms and pathogens in various ways, depending upon the disinfectant used. Some penetrate the outer layer of a pathogen’s cells, which weakens it. Other sort of blow the cell apart, almost like a bomb. All disinfectants are created equal and can be used in the same way. In the United States and Canada, you’ll find thousands of registered disinfectant products for sale, and there are several variations between them. 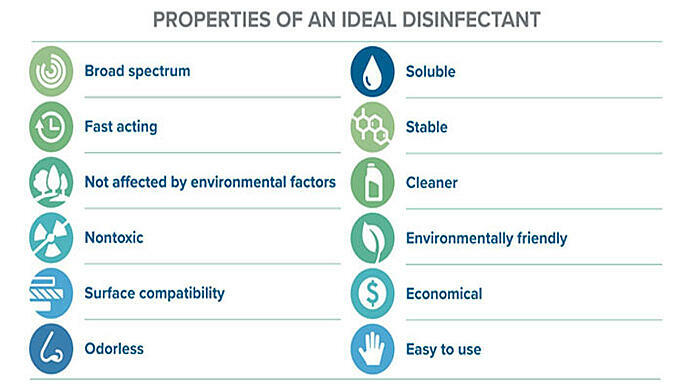 Among the six most common chemistries used for disinfection, especially in healthcare settings, you’ll find vast differences in spectrum of efficacy, concentrations, contact times, label language, and personal protection needed for proper usage. In addition, many disinfectants require you to clean a surface or device first with a product containing detergents before you can use a disinfectant on the surface. In any healthcare setting, infection control strategies must be part of everyone’s job even if they don’t do the cleaning itself. Everyone is encouraged to frequently practice hand hygiene, especially after contact with a patient or items in their environment. Cleaning, disinfection, and hand hygiene are an important part of maintaining a safe and functional healthcare facility. Historically, this was true. In the past 10-15 years, however, companies have been working to bring safer and more environmentally sustainable disinfectants to market. If you’re using an older disinfectant product (such as bleach or phenols, for example), be sure to provide training on protocols for safe use. Safety Data Sheets (SDS) are your best resource to learn about the toxicity and risks associated with using the product. See Section 2 and Section 11 on the SDS for details. Some products do indeed contain chemicals that are known carcinogens, known respiratory irritants (causing occupational asthma or chemical pneumonia), known skin sensitizers, known to release volatile organic compounds (leading to poor air quality), or known to contain nonylphenol ethoxylates (hormone-mimicking agents that can act as endocrine disruptors in the body). Again, not true. Studies have shown that antibacterial soaps are no more effective against germs than regular soap. In fact, many active ingredients used in antibacterial soaps, such as triclosan, not only have negative health effects, but they have been shown to cause antibacterial resistance. Now that you know the top 5 disinfection myths, spread the word (i.e. share, like, and forward to your friends and co-workers) to ensure we prevail over the Microbe Militia, because you know what they say, knowledge is power. While exposing disinfection myths is part of the Infection Control Army’s strategy to defeat the Microbe Militia, planet earth is in desperate need of a disinfectant super hero who is able to battle and defend on all three essential battle grounds: hands, surfaces, and devices. Who will come to the rescue? Olivia is a passionate member of the Professional and Technical Services (PTS) team and is dedicated to educating readers on the importance of Infection Prevention and Control..
Virox.com is a Canadian website. © 2014 Virox Technologies Inc.